The Sixth World is full of dark alleys, twisted corridors, and hidden locations for nefarious activities. Shadowrunners and 16th century explorers both know the same truth - the difference between death and survival when entering a hazardous area may be a good map. Sprawl Sites: North America presents eight full-colour maps that can be used in a variety of sprawls, making it simple for gamemasters to call up a number of different locations when they need it. From a luxury hotel to a collection of blocks in an urban barrens, from a shopping mall to a trideo studio, the collection includes maps that can be used in many different situations. The maps are double-sided, with a key on one side, making them useful as both a guide for players and a reference for gamemasters. The package also includes a booklet providing details on security and other personnel found in the location, along with plot hooks to help involve these spots in your game. 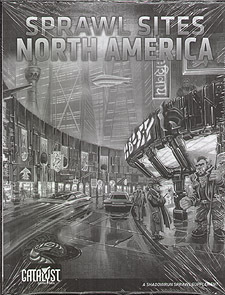 Sprawl Sites: North America is for use with Shadowrun, Twentieth Anniversary Edition.